Your Daily Cute: Two Cats Tuesday: But Mom... We Already Have FUR Coats! Harley and I are shivering here, too! Those are some very cool and fashionable outfits. Pimp is hesterical. He looks like we do when our nutsy mom puts stuff on us. But Moo looks terrific. That is a sharp coat. Love the look on Pimp's face. I live in SC where it is supposed to be warm and it is 15 degrees here this morning. Love the pictures!!! 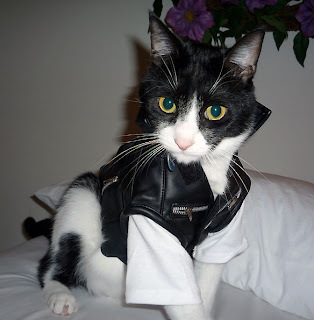 Moo looks just like a little biker dude! And Pimp looks like he's ready to hit the country club for some tennis! Too funny!! 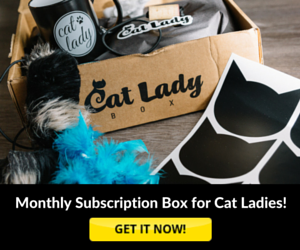 they do not look happy, but at least they allowed you to put it on, my cat would have gone ballistic!! Love those outfits!!! he he - so cute. The eyes on Moo are as big as saucers. Pimp, on the other hand, looks like he's thinking "what we don't go thru for our oomans. Can I take it off now!" We have no degrees to spare here in Chicago, I'm afraid. In fact, I was gonna ask Pimp if he could lend me that stylin' coat. He doesn't look too happy with it. . .
You've got such lovely, well-mannered cats! My boys would have shredded me to pieces if I had put anything on them!! umm my cat Felix would like to be introduced to Moo --- I'm just sayin'. These pics are hysterical! Wow, y'all got some serious fashion going on! It seems to be colder in Florida than it is in Montana! Moo is so tough...look out Harley, you two could really tear it up together...maybe spend a wild weekend in Las Vegas together. Cool outfits...or should we say hot outfits cuz they keep you warm?? We love the leather, Moo!! 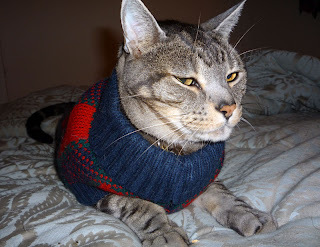 I love your sweaters, very fetching! So fashionable! These would not have stayed on any of our residents for more than, say, 16.7 seconds! 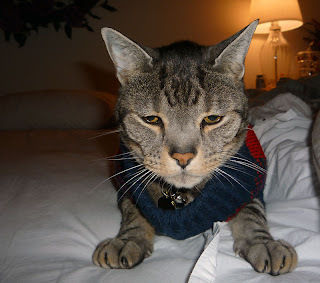 Pimp, you are very handsome in your sweater! 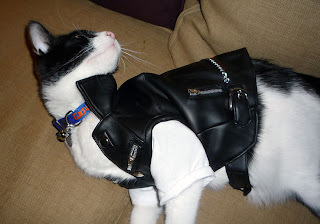 Moo, you are so cool in your motorcycle jacket! The lady kitties better watch out! Oh you guys look so cute!! And we have heard how cold it is there (I mean, for you guys, to us it sounds pretty good right now) so it is good that Pimp and Moo are keeping warm!